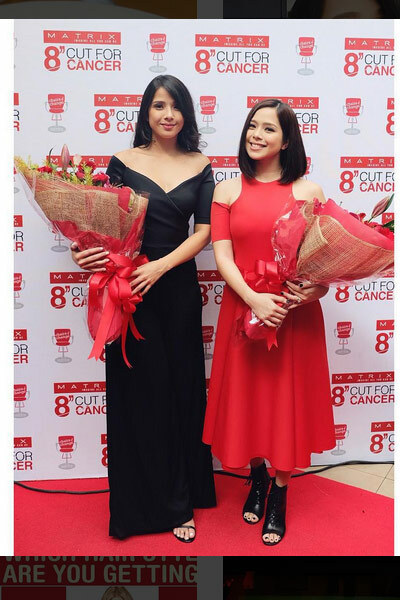 Sisters Maxene and Saab Magalona had 10 inches of their hair chopped for cancer-stricken children. Their locks will be turned into medical wigs for the kids. Flaming red, the color of life, perked up every corner of Megamall Atrium last Saturday, September 19. That's because American hair brand Matrix gathered 100 David’s Salon hairdressers to give time and talent in cutting at least eight inches of hair to donate to young cancer patients under the care of Kythe Ateneo, "an organization that caters to the psycho-social needs of pediatric patients diagnosed with chronic illnesses." Women of all shapes and sizes wore red bibs, sat in chairs, and gazed at their reflection on the mirror, as hairdressers hovered over them and snipped off a portion of their black locks. The hairdressers then wrapped the snipped hair in plastic, handed it over to the ladies, and urged them to line up for souvenir shots against a giant Matrix backdrop. Then all the hair were given to Matrix, which will fashion them into wigs for children with cancer. These women and hairdressers with hearts of gold found a kindred spirit in sisters Maxene and Saab Magalona, who gave up part of their lush locks for a cause close to their hearts. “We know what it feels like to lose a loved one because of cancer," said Maxene. Their father, Master Rapper Francis Magalona died of leukemia six years ago. She continued, "It’s very hard, lalo na sa patient himself." CANCER AND CHILDREN. The actress further explained why she feels for this vulnerable sector of society. "They don’t understand what’s happening to them,” said Maxene, who cheered up cancer patients at the Philippine Children’s Medical Center in Quezon City for last year’s campaign. “Pag nawawalan ng hair because of chemotherapy, it makes these children feel even more like an outcast, how they’re so different from all other kids. Matrix 8-Inch Cut for Cancer celebrity ambassador agreed to chop 10 inches—two inches more than what was required–off her long hair September last year. Maxene was glad she joined the Matrix challenge, which was timed for this month’s celebration of Child Cancer Awareness Month. But before she knew what it was for, Maxene was incredulous. Like most young women, parting with her crowning glory was quite a big decision to make. But the doubts faded fast when she learned everything was for a good cause. SAAB'S TURN. This year, Saab has decided to follow her Ate Maxene’s good example by donating 10 inches of her lustrous hair to sick children. Saab, like Maxene, initially missed her hair. “It was my security blanket. My confidence came from my hair. "I love it because it’s thick and covers my face when I feel I’m not pretty enough,” she chuckled. But Saab, who married musician-bandmate Jim Bacarro in January, realized it’s not how you look but what you are inside that matters. “It’s the way you carry yourself and the things you do. I think all the things I’ve been doing makes me very confident with myself. LOOKING FAB IN SHORT HAIR. Besides, Saab said short hair makes her feel lighter and better. About her new hairdo, she exclaimed, “I look fabulous in short hair. I think it’s also a confidence booster." Now, Saab can only laugh at herself when she thinks of how hesitant she felt about cutting her hair. Those who wish to donate part of their hair and transform lives have up to December 31 to do so. They may send their hair donations to the Matrix Philippine Office (Mezzanine Floor, Robinson’s Equitable Tower, ADB Avenue, Ortigas Center, Pasig City) or have their haircut in any David’s Salon branch in Metro Manila or nearby provinces (regular charges apply).